Khaoyai NP.& Kui buri NP. Kui Buri NP. located on the South of Bangkok about 4 hour by drive .With Khaoyai NP, this is one of perfect combination of Wild life safari trip in Thailand. Kui Buri is most famous for its wild elephant watching. Known to be the best elephant and Gaur sighting place in Thailand, it is almost 99% sure visitors will see elephants any day. Drive about 3 hour from Bangkok to Khaoyai NP. 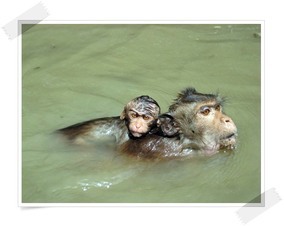 -Pick up from hotel in Bangkok ,Take 4 hour drive to Kui buri NP. Huai Luek Wildlife Watching where is safari start by local guides arranged for private trips in pickup style safari open vehicles. The area with several grassland . The last grassland area has a viewpoint with nice view over surrounding areas. While doing safari trip the local guides will inform each other with walkie talkies when they see animals. Apart from the elephants gaurs, golden jackals and deers may be seen with a bit of luck. -Accommodation inside the park 1 night in Khaoyai NP. ​ Any time of the year you’re pretty much guaranteed to see some of these huge giants if you join one of the safari tours organized by the park rangers. The population of estimated 300 elephants lives in the northern part of the park, where the Wildlife Watching Area was established to let visitors admire wild elephants from the safe distance and without interfering with their everyday routine. The Kui Buri National Park, one of Thailand largest parks covering an impressive 969km and is home to many animals including tigers, leopards, gibbons, dusky langur (the cutest monkeys around), stump-tailed macaques, Asiatic black bear, Malayan sun bear, gaur (Indian bison), serow, Malayan tapir, and four species of hornbill, as well as hundreds of other creatures. However this national park is most famous for wild herds of elephants. This region was once home to huge numbers of wild elephants however deforestation and conflict with humans have dramatically reduced their numbers. The national park works to protect this vulnerable habitat for both Asian elephants and tigers. Park rangers protect this environment through wildlife habitat restoration, anti-poaching patrols, education and enforcing buffer zones to reduce human –elephant conflict. The Kui Buri National Park has been heralded as a true success which was highlighted during a recent visit by the Thai Prime Minister earlier this month. Most park visitors are lucky enough to catch glimpse of these truly wild Asian elephants by taking one the numerous park hiking or driving tours. The park rangers monitor the tours ensuring that the elephants are undisturbed by the tourists. For the intrepid explorers the park also offers the possibility to volunteer on projects from tree planting to construction of elephant watering holes. New watering holes encourage elephants to gather in safer location under the watchful eye of park rangers. Like all good national parks, Kui Buri has several waterfalls, Huay Dong Mai Fai being the largest. This impressive waterfall boasts of 15 separate levels, including a few perfect of swimming. Pha Ma Hon waterfall flows over an impressive cliff and is a triple-tiered, all year round option. Balancing the needs of the environment with the demands of tourists and farmers is no easy task but the Kui Buri National Park has made great strides and with the continued help of the Thai authorities we hope this natural paradise will continue to thrive. ​ The 969 Sq.Km. of Kuiburi National Park spreads over 4 districts in Prachuap Khiri Khan, namely Amphoe Pran Buri, Amphoe Sam Roi Yot, Amphoe Kuiburi and Amphoe Mueang. There are walking trails to enter the wood in Mueang district, Prachuap Khiri Khan province. From Km. 320 on Petchkasem Road, there is an entrance to Ban Nikom Doen Bandai which is a 15-kilometer long tarmac road. Yet, the rest is a gravel-paved road causing great difficulties to travel in rainy season. An overview of geography of Kuiburi National Park is made up of an undulated mountain range and vast watershed areas west of Thai-Myanmar border. The national park sits on the steep Tanaosri Mountain range and contains evergreen rain forest, dry evergreen rain forest, and mixed deciduous forest. Its abundant natural resources includes a variety of economically important plants and natural habitats for a great number of wild animals, for example wild elephants, gaurs, chamois and etc.Kuiburi National Park maintains its natural beauty and intact ecosystem not altered by human exploitation. Visitors can find 2 kinds of accommodation, namely residence house and tent. The national park also provides a safe area to observe herds of elephants and gaurs, so this is the must-do activity. In addition, tourists can try the 300-meter long walking trail to admire Kalamet. The walking route takes about 30 minutes. The aromatic wood of Kalamet has been used to make the urn-shaped casket for the Royal cremation of HRH Princess Galyani Vadhana, the princess of Naradhivas. Admission fee is 200 bath for adults and 100 bath for chrildrent.